There are probably more NLB 225 Series water blasting units at work in the field today than any other single model, regardless of manufacturer. 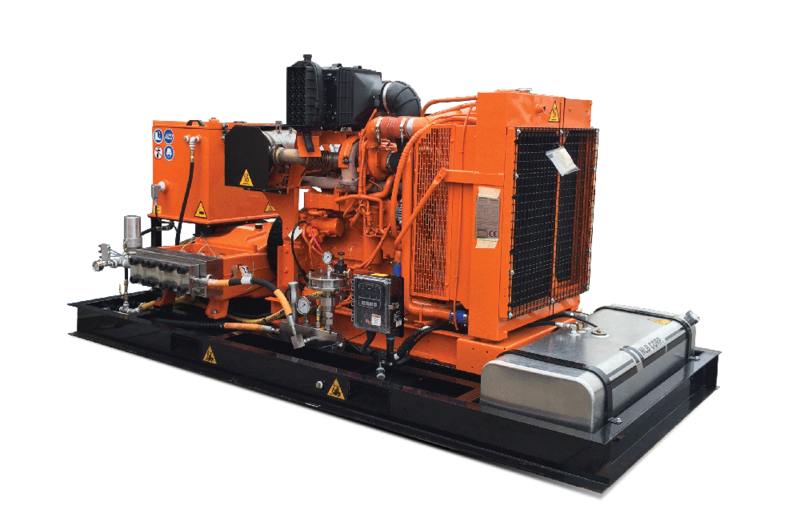 With units ranging in horsepower from 200 to 350 hp (149-261 kW) and pressures from 275-2 800 bar (4 000 to 40 000 psi) its performance lands it squarely in the middle of a host of applications. Whether you need to strip paint, clean tubes, or blast the inside of tank, the 225 Series offers the flexibility and power to get it done. These models are all built around the 225 convertible pump. This pump, with its quick-change, in-line fluid end design, has fewer parts for increased operating efficiency and simpler maintenance. And, it requires only a simple conversion kit to operate at pressures between 552 and 2 800 bar (8 000 and 40 000 psi). The NLB 225 Series units are built to the exact standards that have made NLB equipment the contractors choice for over 40 years. For the European market, we have constructed a special, lighter version pump mounted on a European trailer meeting EU road regulations, with a total vehicle weight of under 3.5 metric tons which is unique in this pump size. All operating controls, including the pressure compensating by-pass valve and pressure gauge with snubber, are mounted on a separate accessory manifold, which provides additional protection for these important components. Units sold in Europe are CE marked and are available in various engine configurations complying to the Euromot 3B (Tier 4i) engine emissions standard which does not require Ad Blue (Def Fluid).